Picasso took to painting pictures in the air with lights, imaginative photographers have followed suit in this new medium of atmosphere and electricity. Lensman George Pickow attached a series of four electric lights (powered by batteries hooked onto the dancer’s trunks) to the hands and feet of young, lovely Harriet Talbot who is studying dance at the Ballet Arts School in Carnegie Hall. 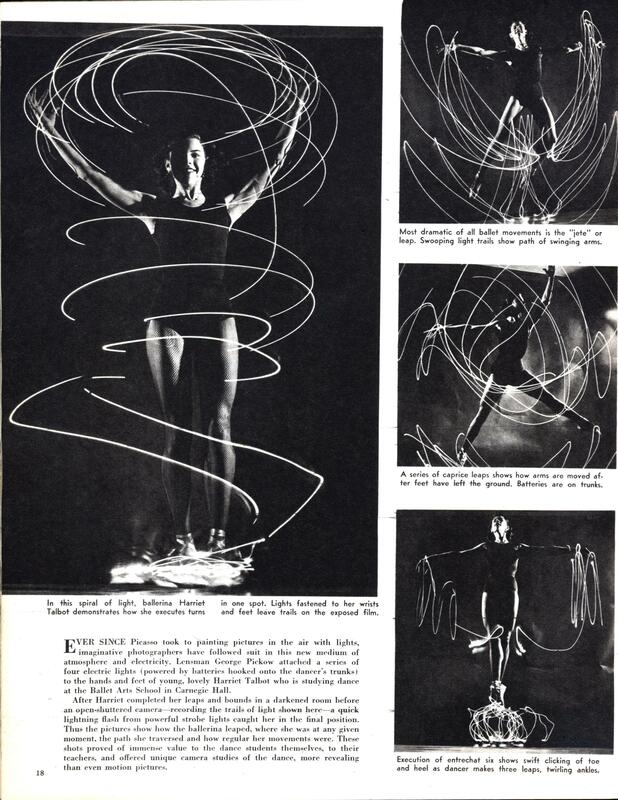 After Harriet completed her leaps and bounds in a darkened room before an open-shuttered camera—recording the trails of light shown here—a quick lightning flash from powerful strobe lights caught her in the final position. Thus the pictures show how the ballerina leaped, where she was at any given moment, the path she traversed and how regular her movements were. These shots proved of immense value to the dance students themselves, to their teachers, and offered unique camera studies of the dance, more revealing than even motion pictures. And because of this we have Gollum today. Gollum? That name has a familiar ring to it. @ Toronto – Isn’t that precious.